Bicycle stations are secure, indoor parking facilities for bikes. Protected with 24 hour video surveillance, they provide safe, long-term parking to safeguard your bicycle against theft, vandalism and bad weather. Only people who register to use a bicycle station can access the facilities. Most bicycle stations are close to public transit facilities to make your commute more convenient. Bring photo ID (and payment, if you want to become a member) to the bicycle station at Union Station during staff hours. You can also make an appointment to register at East York Civic Centre (850 Coxwell Ave.) by calling 416-338-5076. The following form lists the information you will be asked to provide. Staff hours at the Union Station Bicycle Station are Wednesday to Friday, 8:00 a.m. to 12:00 p.m. The station is accessible to parking plan members 24 hours a day, 7 days a week; however, services such as registration and parking plan renewal are available only during staffed hours. The membership fee of $26.91 is a one-time fee that gives you a lifetime membership to any City of Toronto Bicycle Station. Membership allows you to take advantage of long-term parking plans at discounted rates. A parking plan gives you 24/7 access to one bicycle station for as long as the plan is valid. To access more than one station, you must purchase a plan for each one. Pay & Park gives you access to a bicycle station on a per day basis. You must register in person before your first use, but no membership fee is required. The daily parking fee must be paid in advance. All fees shown include tax. 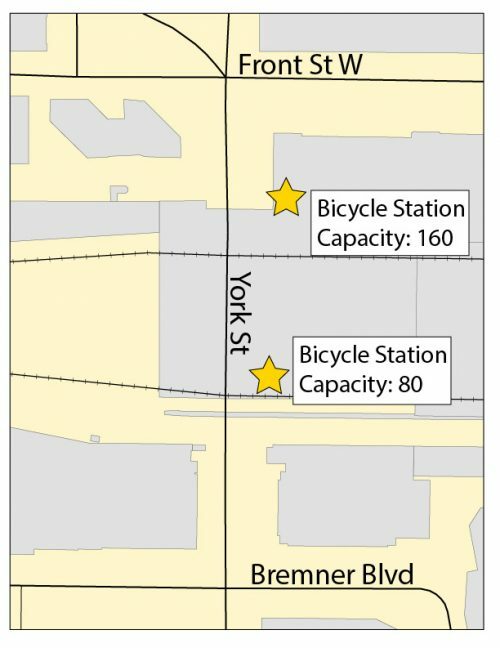 The City of Toronto currently operates three bicycle stations. Registrations are processed at Union Station and the East York Civic Centre. The smaller facility features 80 bike racks, washroom and change room. Tools and pumps are available at both locations for members to perform minor repairs. Toronto’s Union Station is served by GO Transit, Via Rail, Amtrak and UP Express, as well as the Toronto Transit Commission. Located at the main entrance to Victoria Park Subway Station, the bicycle station offers secure, 24-hour bicycle parking with 52 bicycle parking spaces available on two-tier racks. The new TTC station at Finch and Keele features a bicycle station with secure parking for 68 bicycles. The facility opened to the public in October of 2018. The revitalization of Nathan Phillips Square includes a bicycle station in the underground parking facility, which will be open in the spring of 2019. To receive up-dates on the expected opening date, please send your name and e-mail address (or phone number) to bicyclestation@toronto.ca. Four new stations being built for the Eglinton Crosstown Light Rail transit facility will include bicycle stations. The project is expected to be complete in 2021. A renewal notice will be sent to you by email before your parking plan expiry date. Please renew your parking plan on or before the date your parking plan expires in order to maintain uninterrupted access to the station. Union Station Bicycle Station during office hours. We accept cash, cheques, debit cards, Mastercard, and Visa. East York Civic Centre (850 Coxwell Ave.) by appointment. To make an appointment, please call 416-338-5076 or email David Tomlinson. Our cashiers accept cash, cheques, and debit cards. I acknowledge that I am required to pay Bicycle Station fees to the City as listed in Toronto Municipal Code, Chapter 441, Fees and Charges, and on the Bicycle Station website. These fees include a registration fee and a parking plan fee. The registration fee is an administrative fee and I will pay this fee the first time I register to use the bicycle station. The parking plan fee will allow me to park my bicycle at the station for 1 day, 1 month, or 4 months depending upon which parking plan I choose. A limited number of parking spaces will be reserved for the 1-day parking plan (Pay-and-Park). If I choose the Pay-and-Park plan I will have access to the station for one day, during staffed operating hours only and I will not be required to pay the registration fee. I must pay all fees on or before the first day of the contract period. I cannot transfer my key fob or my registration fee, parking plan fees, or any other Bicycle Station fees, nor can I assign them to a third party. Bicycle Station fees may be subject to change at the sole discretion of the City. However, the fees that I am obligated to pay will not change during a fixed contract period. Any increase or decrease in user fees will be applied to new payments or renewal payments. an Overstay fee to the City. All of these fees are listed in Toronto Municipal Code, Chapter 441, Fees and Charges, and on the Bicycle Station website and must be paid within 30 days. I agree to pay any outstanding Bicycle Station related fees prior to the City issuing me a key fob or processing my parking plan renewal. any bags attached to my bicycle, I will ensure that they are empty and the City may inspect these for any reason. I agree to notify the City immediately of any difficulty entering the station, operating the bicycle racks, or of any damage caused to the Bicycle Station facility. I agree that my Bicycle Station Parking Plan will commence and terminate on the dates that are specified on my customer receipt. If I do not pay a new parking plan fee to the City on or before the expiry date of my active parking plan period, the City will deactivate my key fob until I purchase a new Bicycle Station parking plan. Bicycle Station parking plans are available on a first come-first served basis. Either myself or the City may terminate this agreement at any time, with or without cause and without advance notice. If this agreement is terminated before the end of my fee period, I will not be refunded any amount of my registration fee or Bicycle Station parking plan fee. If this agreement is terminated by me or the City, I will return all Bicycle Station property to the Bicycle Station within 30 days. I will not leave a bicycle parked in the Bicycle Station longer than 48 consecutive hours. If I leave a bicycle parked longer than 48 consecutive hours, I agree to pay an overstay fee and I agree that my Bicycle Station parking plan may be terminated. damages or injuries arising out of, or in connection with my use of the Bicycle Station. I agree to release the City and any City Board and each of their respective employees, directors, officers, appointed and elected officials, servants, agents and volunteers from any liability for the theft, loss or removal of any property stored in the Bicycle Station. party which the City, City board or any of its respective employees, directors, officers, appointed or elected officials, servants, agents or volunteers may bear arising out of or in connection with my use of the Bicycle Station. I accept full responsibility for care of Bicycle Station equipment and will assume all costs, payable within 30 days, up to the retail price for equipment that is damaged (other than reasonable wear and tear), or any borrowed equipment that is not returned.